Can’t decide whether you want a gin and tonic or a daiquiri? The gin rickey is for you. 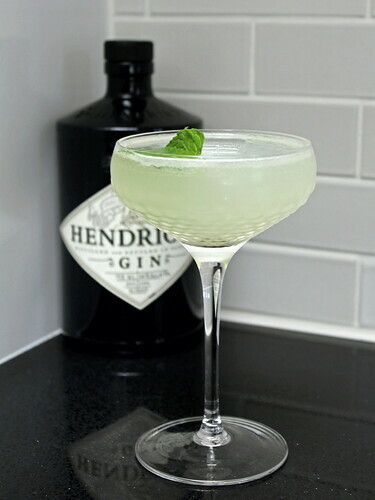 Its mixture of gin, lime juice and simple syrup, plus a splash of bubbly water, is so refreshing — especially with the subtle mint scent courtesy of the garnish. And since it follows an easy-to-remember ratio of 3:2:1 — just like the paloma, but heavier on the booze — it’s a snap to prepare cocktails for one, two or twenty! Want extra lime flavor and a touch of additional sweetness? Substitue DRY Soda Co.’s wild lime soda for seltzer! In a Mason jar (with lid) or cocktail shaker, combine gin, lime juice, simple syrup and a couple ice cubes. Shake for about 30 seconds, or until mixture is ice cold. Strain shaken cocktail mixture into two small glasses (about 6-ounce capacity each). Top with seltzer, and if desired, garnish with mint leaves and pop a cube or two of ice in if there’s room. In a small saucepan (2-quart), combine sugar and water. Set over high heat, cook until sugar dissolves and mixture comes to a steady simmer (immediately returns to a simmer when stirred). Immediately pour hot simple syrup into a small, heatproof jar. Allow to cool to room temperature before using, or covering and refrigerating for up to 1 week.